Drawn from Tolkien's LoTR and popularized through the influence of D&D, orcs have become the staple baddie in fantasy gaming. There are many different depictions of orcs - from the pig-like orcs of the early days of D&D to the lantern-jawed GW orcs that seem to have become the de facto standard nowadays. Me... I kind of prefer the look of the old Heritage orcs that were part of their LoTR line. In addition to differences in appearance, there is also a lot of variation when it comes to determining how tall an orc is. Tolkien's orcs are typically smaller than men, and in fact, some are probably not much larger than hobbits. The largest of the orcs from LoTR are Sauron's black orcs and Saruman's Uruk-hai, which are almost "man-high" (which could still be pretty tall, since "man-high" in Middle Earth is 6'4"). Most orcs from modern fantasy gaming though, seem to be taller and heavier than humans. There are only three sources for 1/72 orcs that I am aware of - Caesar, Orion/Dark Alliance, and Rebel. Many of the Dark Alliance Orcs (PAL72001) are modeled after orcs from the LoTR movies. They are almost the height of a man, so would make good Uruk-hai or black orcs. Caesar orcs (106) seem to be modeled after GW or WoW orcs, so I have to say that I am not a fan of their appearance. 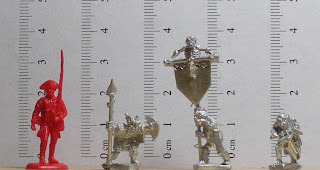 Caesar also released a set of white metal orcs under their Miniknight brand. Anyway, the Caesar orcs are tall, and in some cases, taller than man-height. They do not have much detail, and have a primitive appearance, so they might work as orc barbarians. The following picture, is of Rebel Minis orcs. They were originally produced by Dark Hold Miniatures, sculpted by James Tharpe. They are quite nice, and have the look and feel of the LoTR orcs illustrated by Angus McBride. Most of these orcs approach man-height, and there is even one that is as tall as George. In 18mm, there are the Eureka orcs and man-orcs. The Eureka miniatures tend to be very uniform in size, and images for all of the figures are available on the Eureka and Eureka USA websites. The Eureka orcs are short and squat with bandy legs and long arms. Shown below are the Orc chiefs (300ORC04 - 2 poses); Orc standard bearers (300ORC05 - 2 poses); Orc musicians (300ORC06 - 2 poses); and Orc with sword (300ORC03 - 1/4 poses). Eureka Man-Orcs are modeled after Uruk-hai from the LoTR movies. They are really nice sculpts, but even at 18mm, are too short for 1/72 Uruk-hai without conversion. My only quibble was with the standard bearers. The standards make the figures so top heavy, that they cannot stand upright without basing. Shown below are the Armoured Man-Orc chief (300MRC10); Armoured Man-Orc musician (300MRC12); Armoured Man-Orc with blade (300MRC09 - 1/4 poses); Man-Orc light infantry chieftain (300MRC04); Man-Orc light infantry musician (300MRC06); Man-Orc light infantry with sword (300MRC03 - 2/4 poses). The remaining orcs in this entry are categorizeds as 15mm, although most are proably a lot closer to 18mm than 15mm. The first two orcs shown below, are Armored Orcs from East Riding Miniatures (FT-1). In general, the ERM orcs are a bit flat and crude. They also do not come in many poses, but I think that they will actually look really good when painted up. The next nine orcs are from the Mighty Armies orc boxed set from Mongoose (MGP9901). They are small orcs, and require a lot of work to make presentable, since they are completely covered with flash. The set is now produced by Rebel Minis, so I don't know if they still have the flash issue. The Shadow Corp/Blood Dawn orcs are large 15mm miniatures sculpted by Rene Perez. The Black Orcs are bulky, and clearly influenced by GW orcs. I never liked the cartoony GW look, but I think that so long as they are not painted green, these orcs will actually turn out quite nicely. The first two orcs are Orc Infantry (SC3045/ORC004, ORC002); followed by a [Black] Orc w/Two Handed Hammer (SC3045/ORC006); [Black] Orc w/Polearm (SC3050/ORC007); and a [Black] Orc Champion (SC3054/ORC012). Next, are a mixture of the Shadow Corp Black Orc Command (SC3053), and Blood Dawn orc command set (ORC001). The Blood Dawn orc command combines most of the figures from the two Shadow Corp command sets (SC3053/SC3047), with the exception of the orc chieftain with BFS (ORC011). The Orc Warhorde from Alternative Armies (HOTT1003) contains figures from several different sets of orcs. I'm not too clear on which figure belongs to which set, since the images on their website seem to mix miniatures from different sets. I believe that the first two orcs are Mountain Orcs (HOT4B), followed by various figures from the Orc Horde set (HOT4A). The Orc Horde is supposed to have three poses, but I'm not sure which are the three official poses for the set. In any event, the figures are small and slender, having the appearance of goblins, rather than orcs. In fact, many of these figures seem to be used interchangably with their goblin sets. More orc-like is the Orc Command from Alternative Armies (HOT91). These orcs stand on thick bases, and tower over the goblin-orcs of the Orc Warhorde. The sculpts are solid, though not particularly detailed. I really like the faces, which manages the jutting tusked look without crossing over into GW territory. I also found the orc wizard quite interesting. I imagine that he took the beard and hat of a slain wizard to effect an appearance of power. The SLM Orc Command (ORC01) and Orc Warriors (ORC02) below, are true 15mm orcs. They are beautifully scuplted, but rather delicate looking compared to most of the other orcs of their size. The chief and shaman could probably be used as 1/72 orcs, but the others would definitely have to be used as goblins. Chariot orcs are true 15mm figures. The Armoured Orcs with standard (GOB11) are shown below. Some of the figures seem to be used interchangably with the Chariot goblin command set. The orcs are short and bow-legged, with long arms. Last is the Tin Solider Orc Command Pack (DFA18). There are three poses supplied in duplicate. They are by far, the shortest of the 15mm orcs. The sculpts are too cartoonish for my tastes, though I think that I can use the drummer. If you've gotten this far, congratulations. This is a long entry, and does not even cover all of the manufactured 15mm orcs. Anyway, to summarize, I think that Caesar, Dark Alliance, Rebel, and Shadow Corp orcs, as well as BRF Great Orcs, work the best for 1/72. Some of the Alternative Armies, ERM, and SLM orcs are fine as well. The short stocky orcs from Chariot, BRF, Eureka, ERM, Mongoose, and maybe Tin Soldier would work as small orcs. Other 15mm orcs of the slender variety would work better as goblins. A comparison of orc archers. The first archer is made by Caesar, while the next three archers are Shadow Corp orcs, consisting of an Orc Bowman (SC3046/ORC003), and two Black Orc Bowmen (SC3052/ORC010). Next is an Eureka Man-Orc light infantry archer (300MRC01 - 1/4 poses), an Alternative Armies Orc Archer (HOT38), and two orcs from the Mighty Armies orc boxed set. Brilliantly helpful report and comparison! Thanks so much, I'm glad to find blogs with content I really like. Have you seen mine? I'm currently undertaking a project for 1/72 fantasy and your comparisons have been very helpful. Drop by and feel fre to comment. Thanks and kudos to a fine and enjoyable entry! Hi, yes I've read your blog. I picked up some Mageknight tanglewood spirits after I read your entry on Ents, and I particularly liked your use of HaT Sea Peoples for Uruk-hai! I want to ask you maybe a noob question. 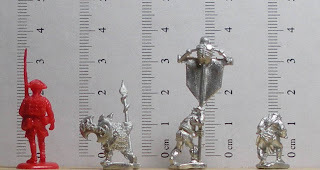 We want to get 1/72 orcs and goblins from Caesar Miniatures, and I found here the orc's measures, but can you tell me how "tall" a goblin? Can we use them together, are they scaled to each other and to medieval knights?